Jane the maid: Downton Abbey’s manic pixie dream girl. Jane is Downton’s manic pixie dream maid. Nick Briggs/Courtesy © Carnival Film & Television Limited 2011 for MASTERPIECE. A moment of silence for poor Lavinia. Even she seemed to realize she was merely a plot contrivance. Her existence had meaning solely to the extent that it provided an obstacle for Matthew and Mary. When the script at last dropped the sword, Lavinia meekly excused herself from the series and urged the resolution of the Mattharyfest Destiny. At least we understood what Matthew saw in her. She was a fetching, chipper, loyal, selfless gal. Some of the other Downton romances are far less fleshed out. 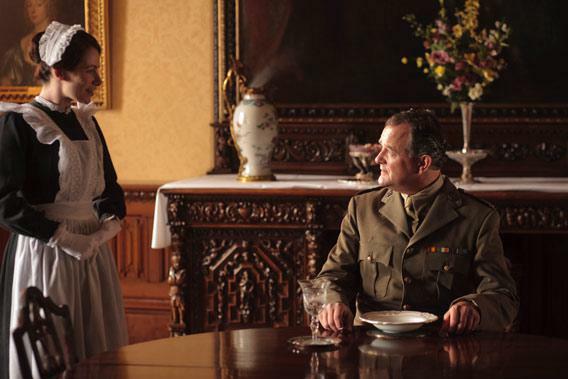 For instance, I still can’t fathom why Jane the housemaid would have the hots for Lord Grantham, yet with just a few shared glances they were off and running. Jane shows up at Downton, bats her eyes at Lord G, absolves his every weakness, makes him feel virile, and then leaves with no fuss when he suddenly relocates his conscience. Is she Downton’s manic pixie dream girl? I’ve also lost track of what Sybil sees in Branson. Early on, he was a driven fellow who kept aware of the world, had dreams and goals, and walked with a swagger—certain he was destined for something more. Lately, he sits around the garage waiting for Sybil to decide if she likes him or not. He isn’t particularly funny, interesting, thoughtful, or charismatic (though he does have a way with a hip caress). Were you two amused by the fact that Branson’s new gig as a content producer is spun by the Crawleys as a possible fig leaf for his downmarket background? Or, as Sybil puts it: “He’s a journalist now, which sounds better for Granny.” Later, the dowager countess gets on board, too: “He’s political, a writer … surely I can work with that.” I guess it’s nice to know that if I ever go back in time and elope with Lady Sybil, I won’t completely scandalize the aristocracy. This episode truly belonged to Dame Maggie Smith. The D-to-the-C was on fire this week. Sure, she can zing like an in-his-prime David Spade. But she also shows so much wizened heart—her sit-down with Matthew was chock-full of the caged British soulfulness that is really what I most want out of Downton dialogue. “We will not have a falling out over this,” she assures Matthew, before making a strong case that he should choose carefully in marriage because “there’s no getting out of it—not for our kind of people.” This felt like the first time she allowed that Matthew was indeed her kind of people, and yet it was with subtlety and emotional restraint that she acknowledged his new standing in her eyes. So next week’s PBS finale of Downton Season 2 (can this be the end in sight? I’ll miss our little club!) aired in the U.K. as a “Christmas Special.” Viewers over there had to wait two months after the end of the regular season before receiving this splash of brandy on their figgy puddings, so perhaps we should be grateful we need only wait seven days. June, as our resident Brit, can you explain: What’s the deal with this tradition of Christmas specials? The only nonrerun TV Americans get on Christmas is NBA games and the evening news. How popular does a show have to be before it reaches Christmas Special status? Like, Dr. Who popular? Or only Skins popular?